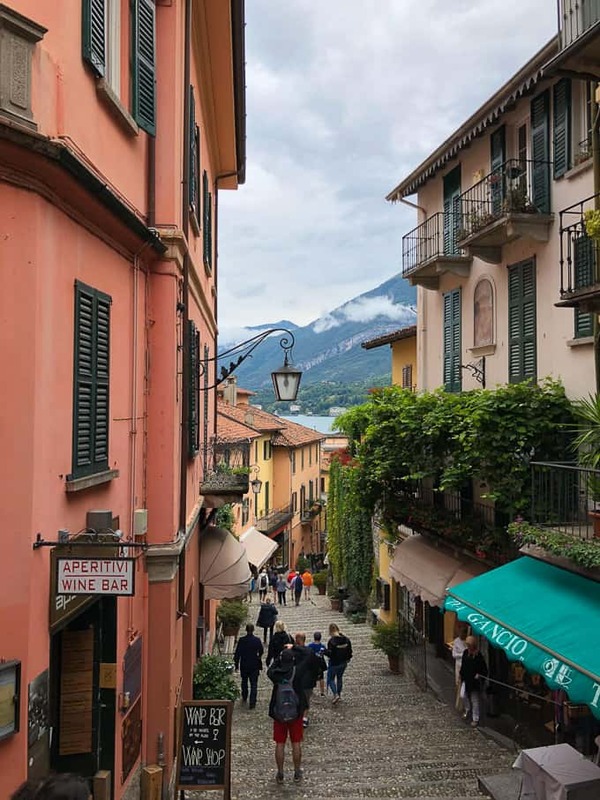 A guide for what to see and where to eat during 3 days in Lake Como, Italy. This kicks off our Italy travel series! 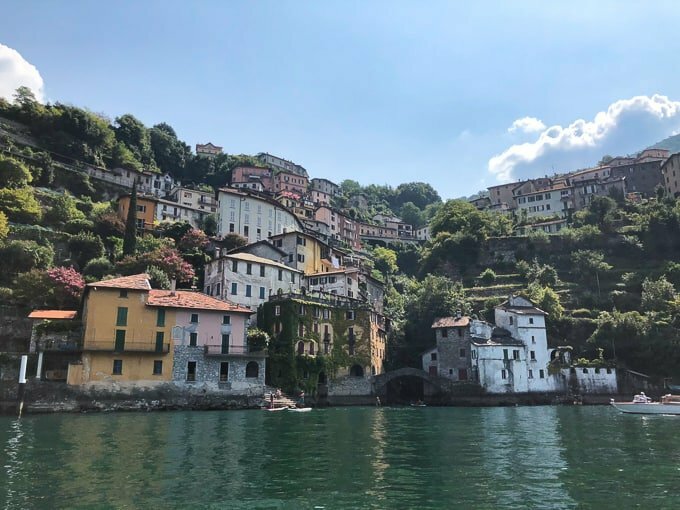 I wasn’t sure whether or not you guys get sick of the multiple travel posts and if I should just do one 3-week Italy recap but I was psyched to learn from you guys on IG that you’re into the multiple detailed travel recaps! 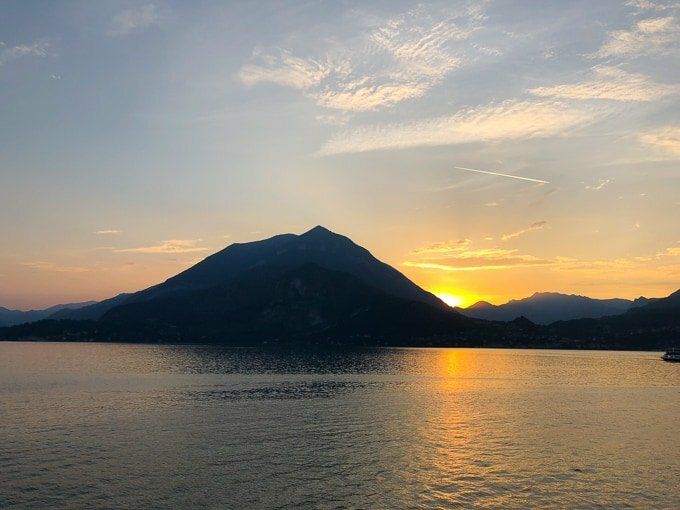 So let’s start with a quick rundown of our itinerary for 3 weeks in Italy in case you’re looking at big picture where to travel in Italy. 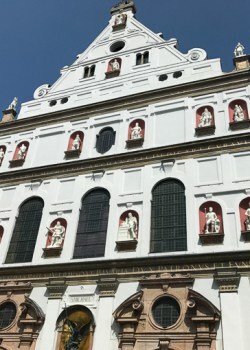 Would we change anything to our itinerary? 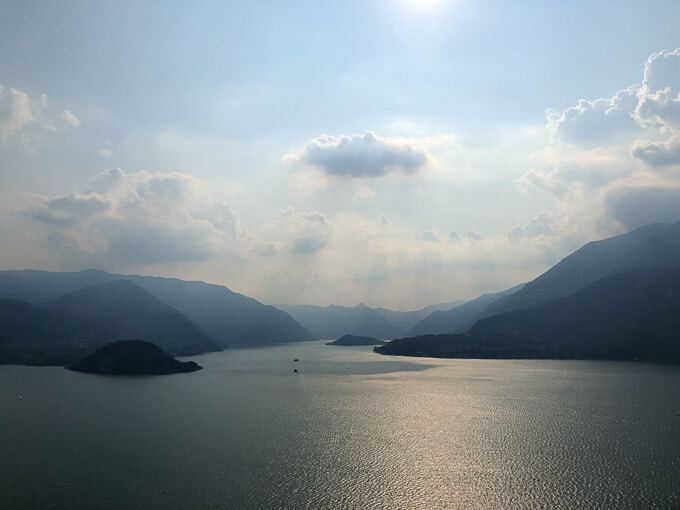 The only thing we might change is skipping Milan and taking the train from the airport straight to Lake Como, which is only an hour away. Other than that, I’m glad we were able to see everything that we did and very glad we didn’t pack in anything more. 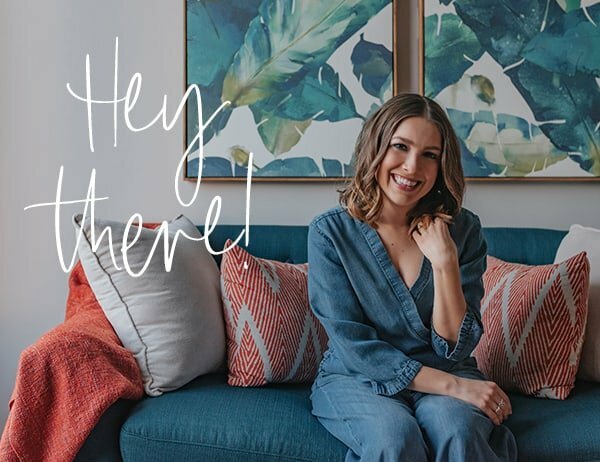 I saw some sample 3-week itineraries that covered Southern Italy too but you could only stay 2 nights in each place and that would’ve felt way too rushed for us. 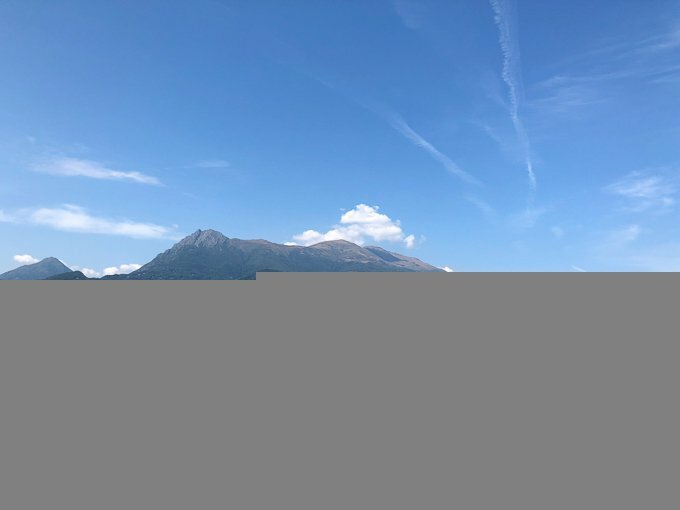 Start at Milano Centrale Train station and get on train heading for Sondrio or Tirano. 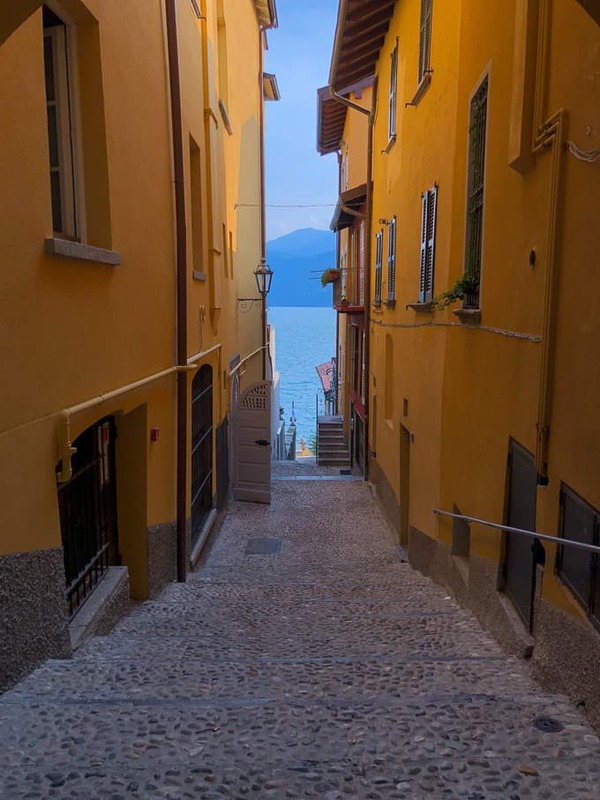 These two lines stop in Varenna. Trains leave every 20 minutes on the hour. Sit on the left side of the train to get the best view. We stayed in Varenna, which is easily accessible by train and less crowded and touristy than Bellagio. 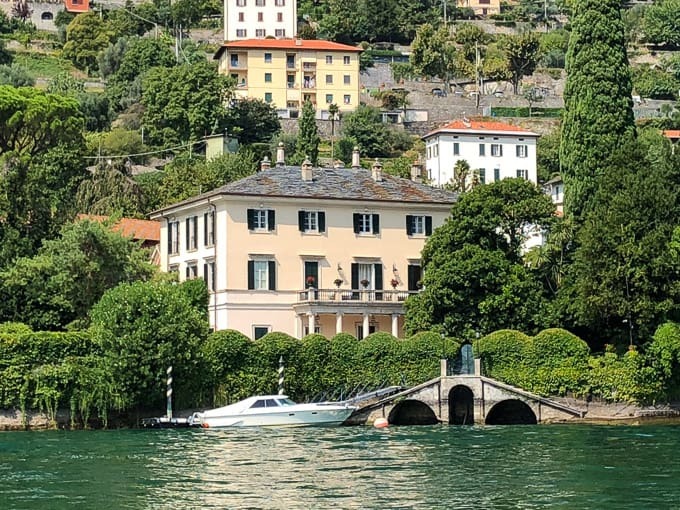 The three most popular towns are Bellagio, Menaggio and Varenna. Varenna is a little sleepier than Bellagio but has more to offer than Menaggio. We’d go back to Varenna in a heartbeat. 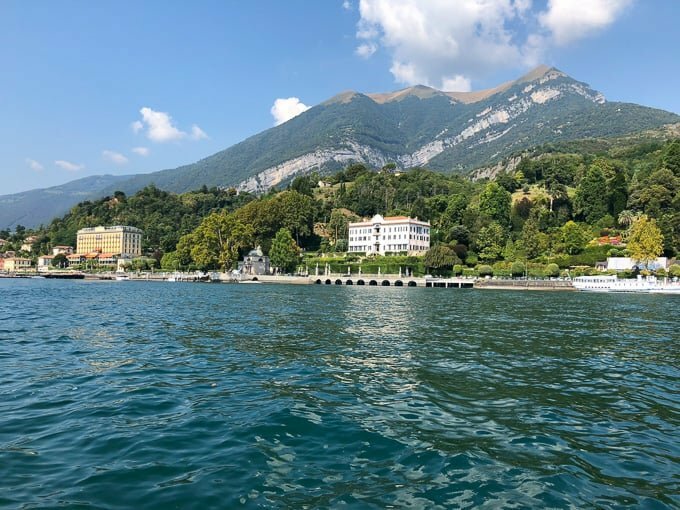 We stayed at Hotel Du Lac, which was one of our splurges for the three week trip. 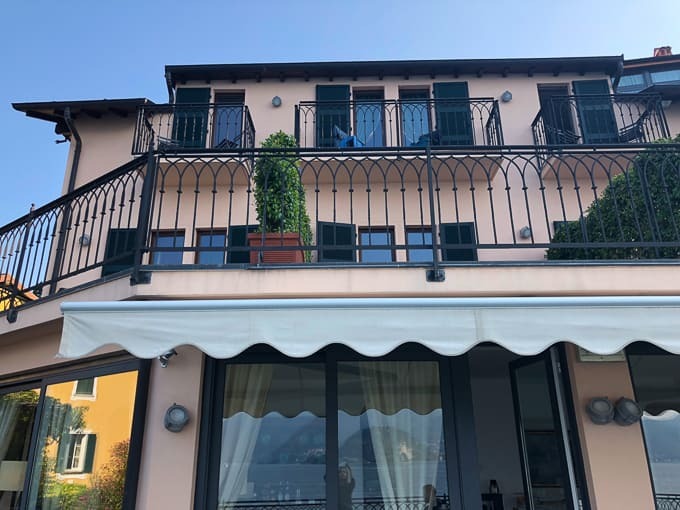 Most of our accommodations were Airbnbs or budget hotels but we decided to bask in the Lake Como luxury here. Plus we had our own little private balcony right on the lake which made the room entirely worth it. Not to mention the happy hours (or appertivos) on their private deck out back with complimentary meat and cheese boards! The best way to soak up the sunset views. Go grab lunch because traveling is exhausting and you’ll need to refuel and recharge the batteries. I loved the simple, inexpensive restaurants right on the water, which were perfect for a lunch view. Check out either Nilus Bar or Bar Il Moto (right next to each other). Go for a dip in the lake to cool off after lunch. Seriously, it’s SO refreshing. Check to see if your hotel has a dock you can use. 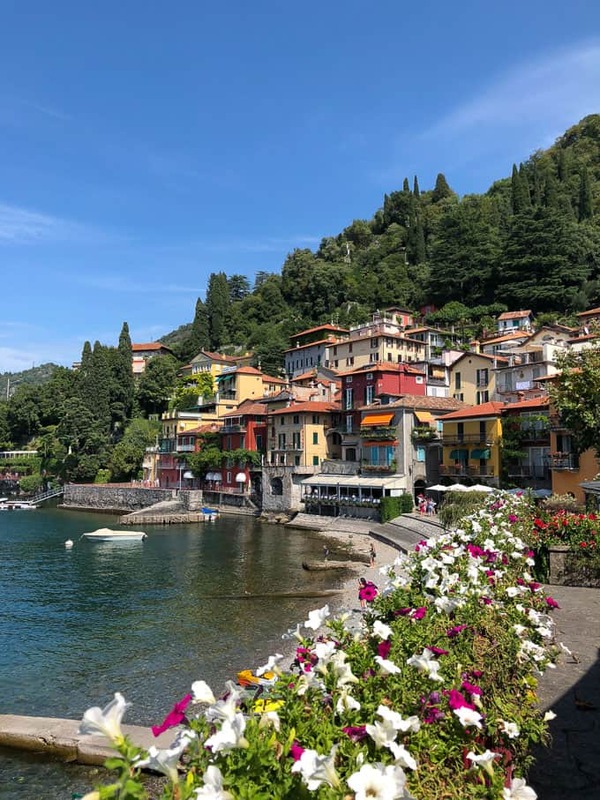 If not, head to Lido di Varenna, part of Ristorante Bar Lido, where you can pay to rent sun bathing beds and use their private dock. The first day we just laid in the sun, I listened to Shrill by Lindy West (go read it), and we took dips in the lake. This was the point at which I said, never leaving. After soaking in some vitamin D, we got dressed and had appertivo out on the deck before dinner. 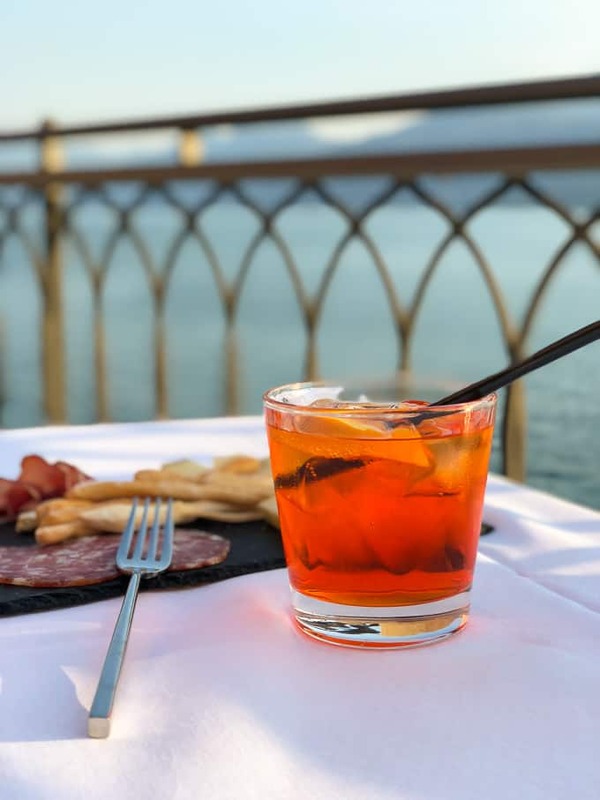 The sunsets are gorgeous to watch while you sip on an Aperol Spritz. I mean they’re gorgeous regardless but the appertivo just adds a little somethin somethin to the overall experience. 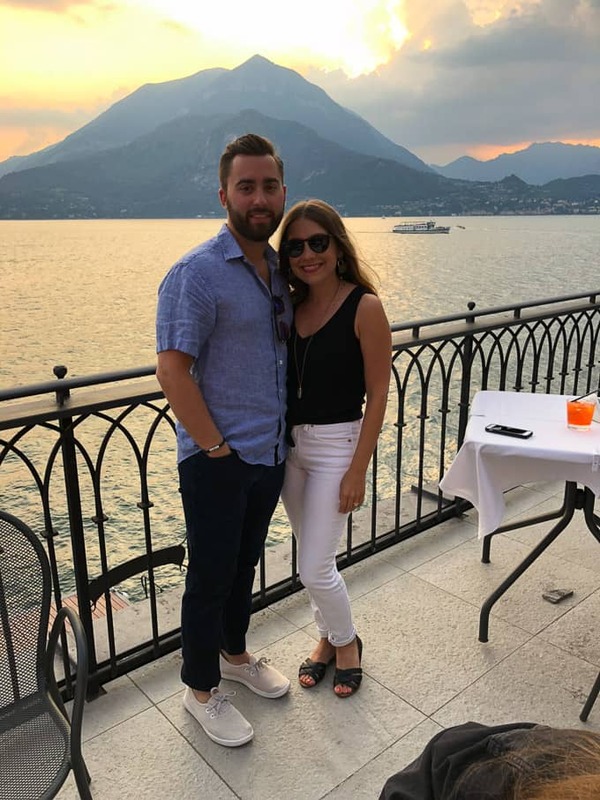 Dinner that night was at Ristorante La Vista at Albergo Milano, which is known for its views of the lake. 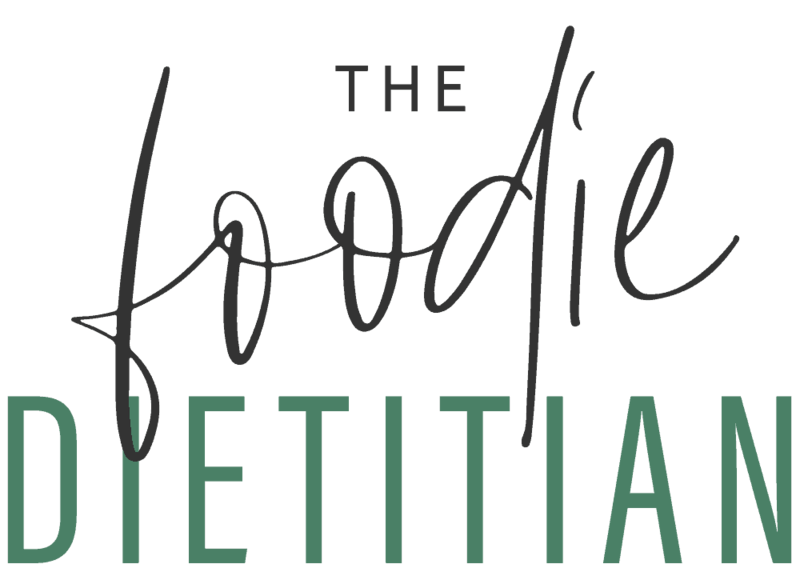 Overall the food was just OK and the food wasn’t worth the price but if you go here know that you’re essentially paying for the view. Also worth it was making friends with two couples who were close to our parent’s age and getting invited to go on a private boat ride with them the next day! LOL Steve and I have a running joke that we always make friends with older couples while traveling. It’s as if they can smell our 31 going on 90 ages. The next day we set out to meet Jack, Vicki, Hank and Susan (our new BFFs) for the boat ride. Jack has his boating license so he was taking Captain reigns while the rest of us got to kick back, relax and enjoy the views of the lake. 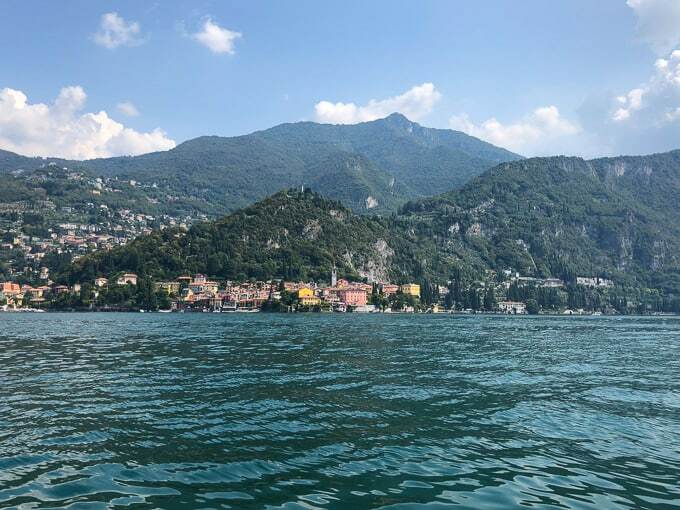 If you go to Lake Como, you must get on the water in some which, way, shape or form. You really can’t see the entire lake and all its majesty without being on a boat. Plus, it’s the only way to see The Clooney’s home. 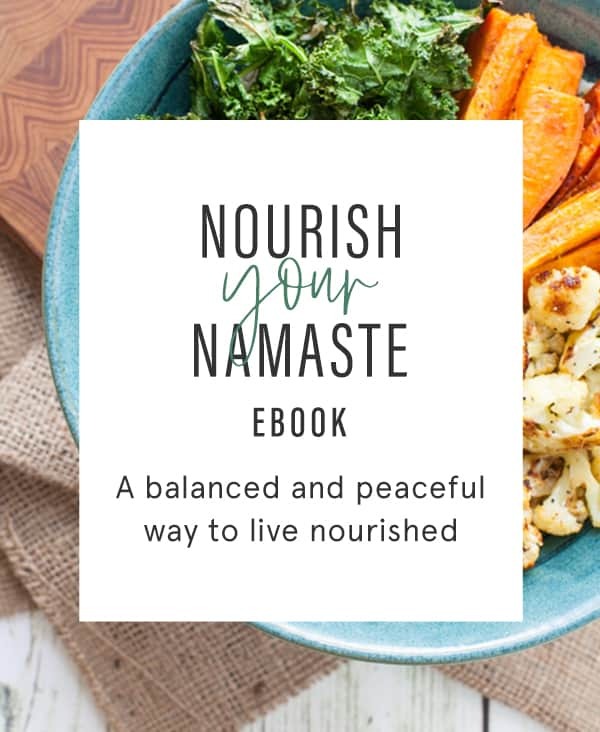 Here it is below! Along with the 5 homes that surround it cause you know, privacy. Also along the way we spotted this museum, which was featured in Casino Royale. There’s Varenna (below)! 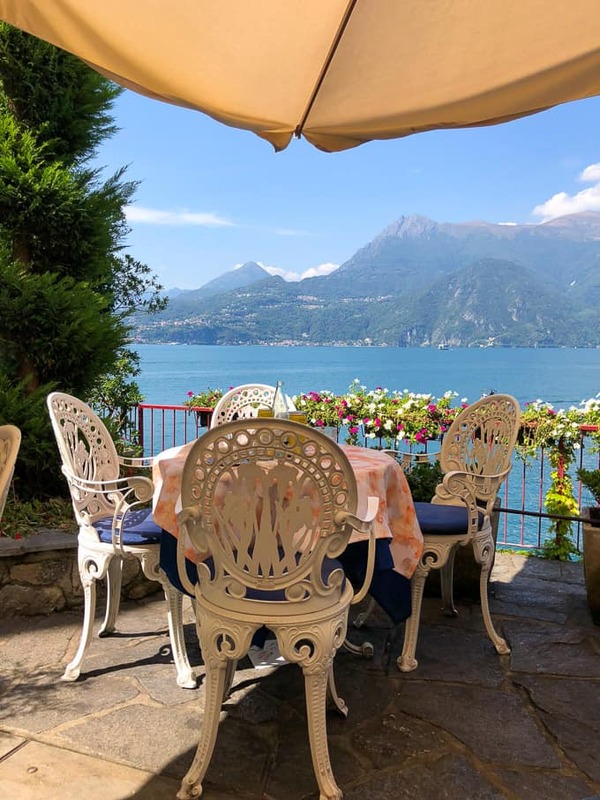 Have lunch with your new friends and then part ways to get ready for a hike to the top of Varenna. Go past the ferry dock boat and follow the signs for Castle Vezio for the hike. It felt nice to move our bodies a little after sitting on the boat and to take in these STELLAR views. 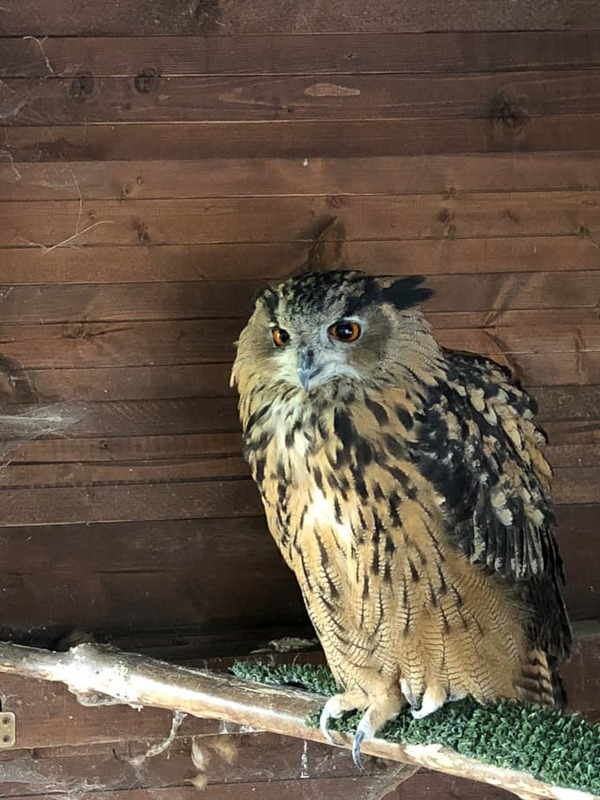 Don’t forget to say hi to Artu when you get up there. I thought he was super cute and wanted to bring him home with me. Steve reminded me that he would eat me and Constantine. Cuteness factor decreased a few points. 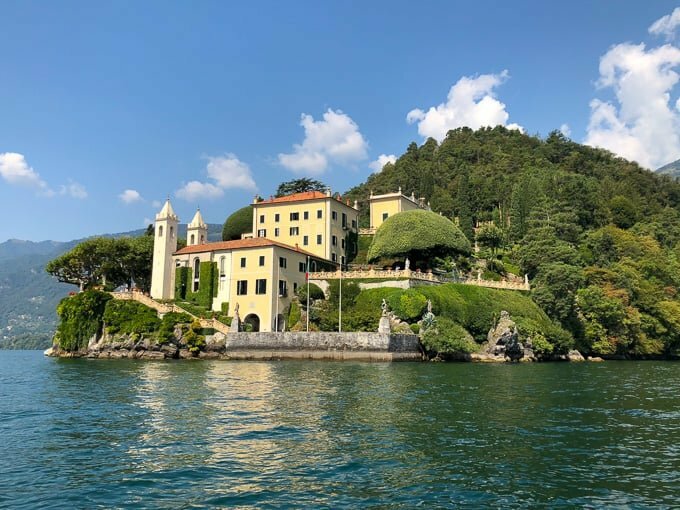 You can hike down the opposite side and it you’ll end up near the Villas in Varenna that you can tour if you’re so inclined. Villa Cipressi has a gorgeous garden that you can enjoy an appertivo at but they were closed for a wedding the evening we strolled by. 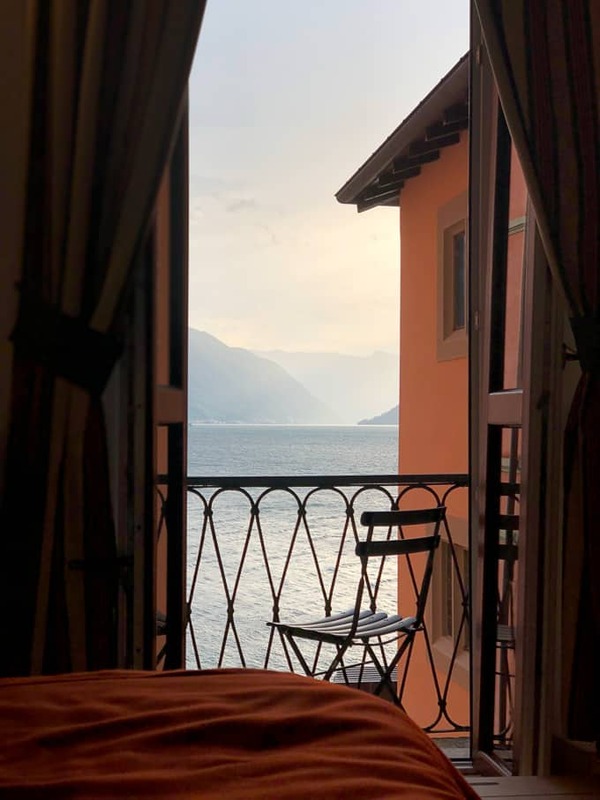 That was fine because appertivos with a view are not hard to come by in Varenna. Dinner the second night was much better and I’d definitely recommend it – Osteria Quatro Pass specializes in local Varenna cuisine (like lavarello, a local lake fish) and has a lively feel to it. They have a few tables outside on the sidewalk and a number of seats inside. Make a reservation in advance for this restaurant or Albergo Milano, described above. We shared a delicious eggplant parmesan for our primi (first course) and I had the grilled lake fish for my secondi (second course). Also this cheesecake with fresh raspberries was TO DIE FOR. 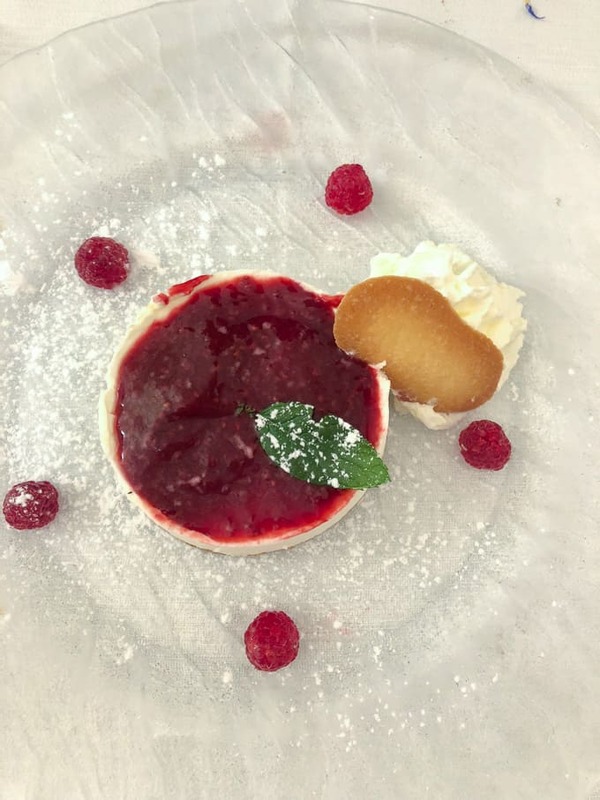 It was the creamiest cheesecake we’ve ever had. Day three it rained on us but we put on our ponchos (well Steve gave me his poncho; I didn’t pack one, whoops!) and went on the ferry to visit Bellagio. Bellagio is the more touristy town on Lake Como, known for its shopping. I’m not a big shopper so I could’ve skipped this town but if you’re itching to explore another lake town, it’s worth seeing. 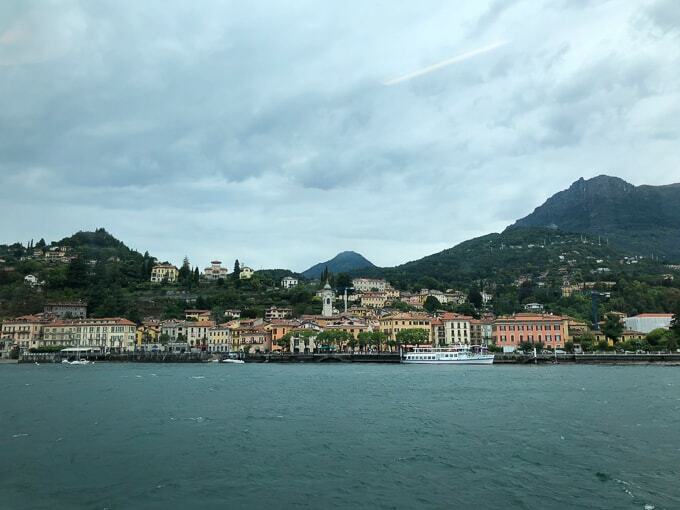 After getting caught in a downpour in Bellagio, we took the ferry boat back to Varenna to dry off and get ready for dinner. 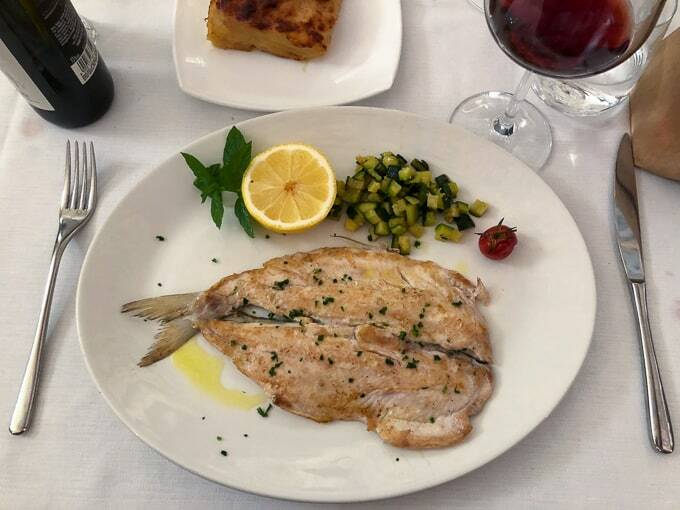 We went to Ristorante del Sole, which faces the town square and offers up reasonably priced meals. 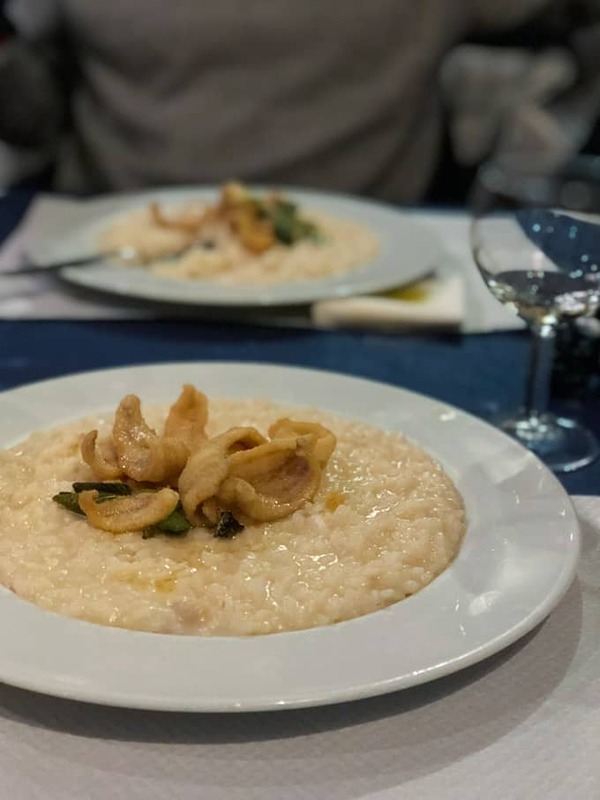 We ordered the sage risotto with fried lake fish (most restaurants in Italy only serve risotto for 2 people min). It was so creamy and rich and the sage was infused throughout. The crispy fish on top was like icing on the cake. The next day we hopped on the train and were off to Venice! 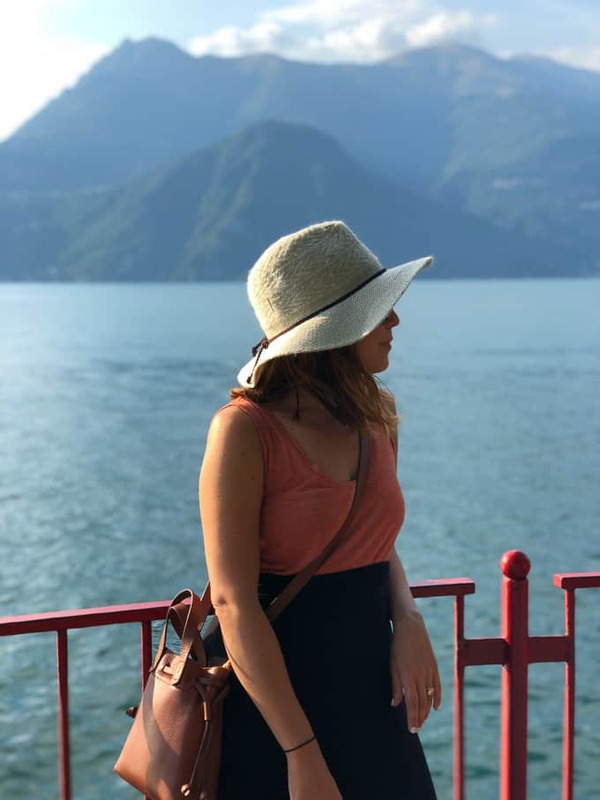 Overall, I loved Lake Como and would go back in a HEARTBEAT. 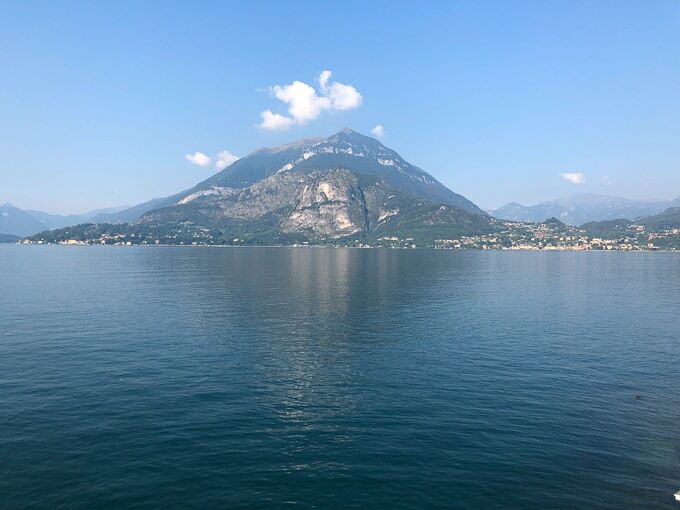 I love being near water – I find it to be super calming and peaceful and Varenna was the perfect pace to ease into our trip. Plus, I could stare at the Swiss Alps ALL. DAY. LONG. Next stop (blog post), Venice! Tell me, have you ever been to Lake Como or Italy? What was your favorite stop? 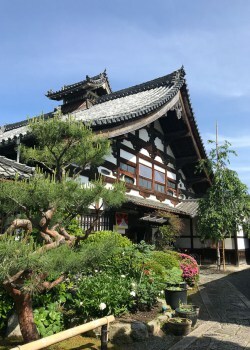 Check out more travel posts below! 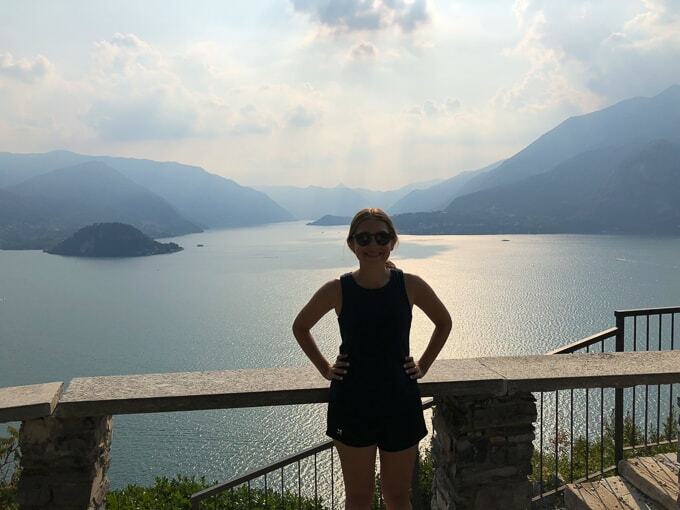 LOVE your travel posts 🙂 My husband and I honeymooned in Italy and the Cinque Terre and these pics are totally taking me back! Stoked for these posts! My husband and I are aiming to plan a (belated) honeymoon next fall and your itinerary is almost identical to what we’re hoping to do- except do it the opposite way and finish in Milan (and also maybe spend longer in tuscany/lakes area, skipping Venice). It was so strange ready this post as you guys did almost the exact same trip that my husband and I did for our honeymoon two years ago! 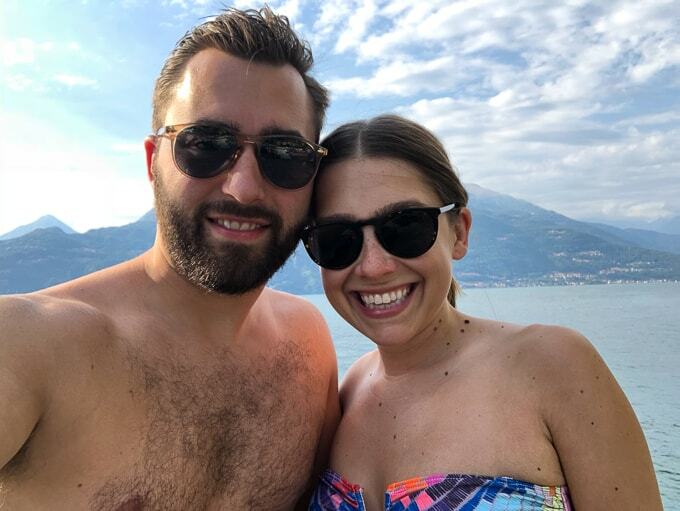 We did a night in Milan (I agree, you could totally skip it), then went up and stayed in Varena for 3 nights, went to Cinque Terre (my favorite!) for 4 nights, the Florence for a few nights and ended in Rome. 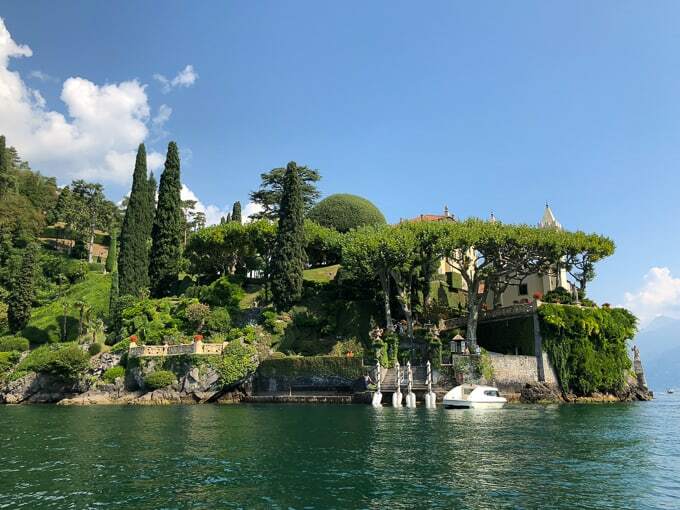 We also stayed at Hotel Du Lac – so worth the splurge! 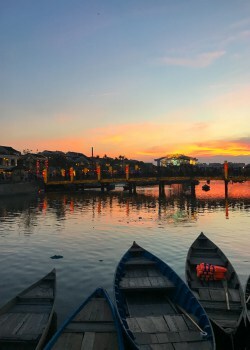 This post makes me want to go back! My favorite spot in Lake Como was Bellagio, where we stumbled upon this amazing jewelry shop and had some of the best gellato of the trip!